Join In is a three-level speaking and listening series that teaches an important aspect of English. This book is for beginners and can be used in the classroom for learners developing conversation strategies for what to say and also how to say it. It is clearly designed for an American English teenage market, with bright colours on each page and teenagers featured in many photographs, illustrations and cartoons. There are two lessons in each of the 12 units in the Student Book 1, and each lesson focuses on a different aspect of the unit topic. In Lesson 1, the lessons are organized into five sections; each one is carefully graded and includes task-based activities considering cultural differences that stimulate students to learn and provide opportunities to speak and listen. In Lesson 2, activities in pairs introduce more vocabulary related to the unit topics. Conversation strategy focuses on a feature of spoken English and provides examples of how to say what you want to say in daily life. At the end of the book are 5 pages of task-based conversation practice ‘Join In’, working in pairs or role play, 12 pages of grammar review, and a 5-page vocabulary file, although the vocabulary file looks like American English. 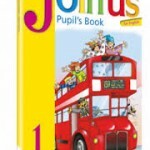 This Student Book1 is supplemented by Join In 1 Student CD for self-study. If you teach teens at beginner level, students would enjoy the challenge for learning many strategies for self-expression in English language, what to say and also how to say it. Especially, this book would help learners improve their English through guided practice in speaking and listening.